Miles on the MBTA: 30 (Mattapan Station - Forest Hills Station via Cummins Hwy. and Roslindale Square) - Technically! 30 (Mattapan Station - Forest Hills Station via Cummins Hwy. and Roslindale Square) - Technically! My father and I had some things to do in Ashmont, and we thought we would take a bus while we were at it. 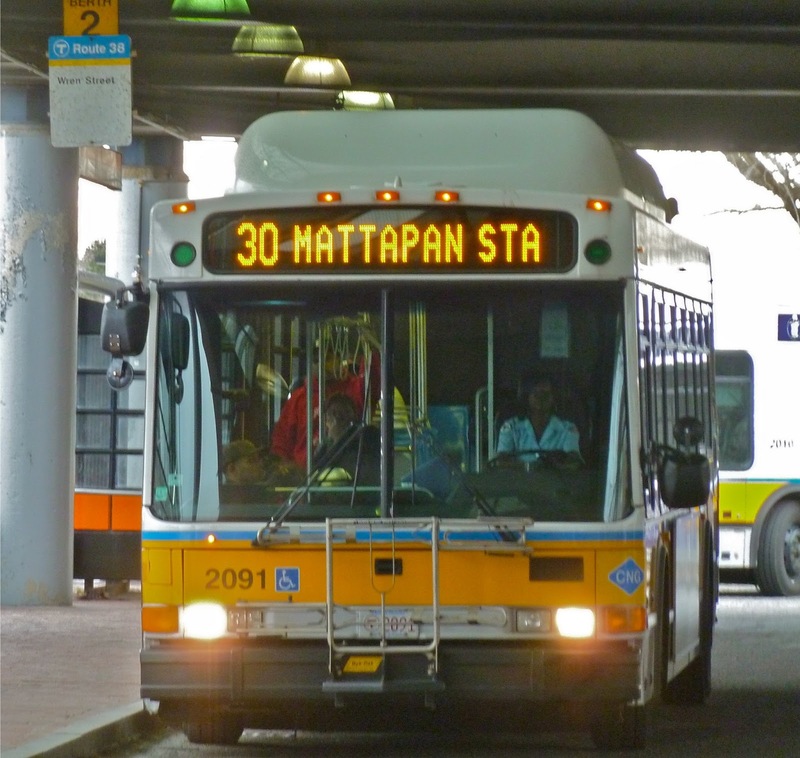 We planned to take the 31 (Mattapan - Forest Hills via Morton St), so we took the Mattapan High Speed Line to Mattapan. It took us a while for to find the 31 berth, and the bus wasn't coming. After about 10 minutes, we saw the 30 pull up at a parallel berth. We figured it would take us to Forest Hills anyway, so we hopped on. The 30 takes a very residential route on Cummins Highway. You even get to cut through a graveyard, just like the Mattapan High Speed Line. After riding for a bit (we didn't make many stops), a strange sound came out of the CNG bus we were riding. We stopped for a minute, and then continued. We made it a few more blocks, and then it happened again. We found out that the bus was losing its transmission. It didn't help that Cummins Highway happens to have a bunch of steep hills. We stopped completely at Hyde Park Avenue. "Does anyone have to go to Roslindale?" Asked the bus driver. One person did. "As for the rest of you," the bus driver continued, "I recommend you get on the 32 on Hyde Park Ave." We all got out and waited at the bus stop (no bench or anything). A few minutes later, we saw the person who wanted to get to Roslindale get kicked out of the bus. After waiting for a really long time for the 32 (isn't it supposed to be a Key Bus Route?) my father and I decided we could walk the rest of the way. He wanted to walk on Hyde Park Ave to Forest Hills, but I wanted to walk to Roslindale and take a bus from there. We ended up doing my idea, so we started walking on Cummins Highway. "Is Roslindale close to here?" my father asked a passerby. "Ya, ya!" he replied. Good. This would be a piece of cake. 20 minutes later, we came to the Roslindale bus shelter, extremely tired out from those hills (but it was a shorter walk than what my father suggested). At the shelter, we waited for about a half hour for a bus to Forest Hills. Finally, a 36 came along, and we were soon on the Orange Line. As you can probably infer, I did not take this picture during my ride. Actually, I happened to be in Forest Hills and I saw the 30, so I took a picture. This happened over three months after originally posting this. Ridership: Locals, locals, locals. And very few locals at that. There were only about 10 on the bus, including my father and me. Granted, it was a Sunday, but the 30 still isn't exactly a Key Bus Route. Pros: You get to see a quiet part of Boston unknown to tourists. It's an interesting ride overall, especially the graveyard-cutting. Plus, you can't help liking the hills. Cons: Who uses it? 10 people on a bus, even for a Sunday, isn't very good ridership. I mean, about a fifth of the Cummins Highway portion of the route is graveyard-cutting. Not much ridership comes from that section, I'll bet. Also, though not affecting the score, I can't help thinking differently about the CNG buses in Boston now. Nearby and Noteworthy: I have no idea what sort of interesting things are in Roslindale, since we didn't really explore it. However, I desperately want to visit the Bay State Model Railroad Museum. It's only open Wednesday nights, but it looks really awesome for train-obsessed people like me. Latest MBTA news: More Orange Line shuttle buses this weekend (sigh). Like before, the buses are running between Sullivan Square and Oak Grove. How can I make it more public? Somebody told me recently that the Mattapan High Speed Line is the only train to run through a graveyard. Can that be true? Wait... do you mean the only train in the world? That's definitely a bit hard to believe. It is, however, the only MBTA train to run through a graveyard.